Do you often feel like you’re just winging it at home? If yes, then probably something isn’t working in your favor and it must be making you feel either stressed or low. In a world where we are all increasingly busy, there is no space for “going with the flow”. We need to keep nurturing our relationships with our partner and our children, we need to organize the house and still have time for our friends and ourselves. There is hardly time for a paid job on top of all this! Yet, most of us do go to work and some of us even pursue portfolio careers meaning we have even less stability or predictability in our work life. To run your home life successfully you need to see it as an organization – the most important one in your life! – and run it like a business. 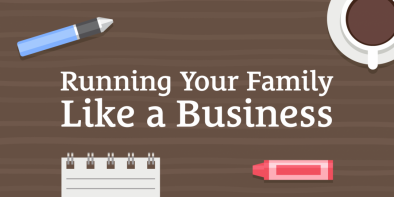 Here are 6 business strategies to help organize your family life. Know your common values as a couple. This is the basis for making decisions. Ignore this step and I guarantee one of you will soon be sleeping in separate rooms. To apply this technique, both of you need to think about what you admire in each other. My husband likes the fact that if I take on the responsibility of dealing with something or someone, I will see it through. I am conscientious, fair, have good organization skills, and I persevere until I get the job done. Meanwhile, I love his direct and clear thinking; he thinks fast and he talks fast. Put these two together and we can get things done. But most importantly, we trust and champion each other to take on anything. You need to make a profit. This rule is simple, yet often misunderstood. Money coming in needs to be more than money going out. Identify your expenses (I know… but you really have to do it). For regular bills, set up auto-pay. Make sure you put money aside for the future. Use the rest for whatever you like. After taking stock of your finances, you can find ways to reduce expenses, if you wish. Having a common plan about your finances takes away the stress of having to make decisions each month and saves you from tension or arguments. Once my husband and I had organized our finances, we started sleeping better at night! Decide on your single top priority. We all have lots of things to do each day. If you are living in the real world then you probably have bills to pay, aspirations to achieve, and errands to run. But you need to consider these all together and decide, on top of the daily ‘must dos’, what is the number 1 thing you should try to accomplish as a family in the next months, years, and beyond? It could be something like “get fitter”, “eat more healthily”, “volunteer for a good cause,” or “have fun”. Once you’ve identified your single top priority, you can plan for it. In our family, we highly value fun so we make time to play and read books with our son every day, as well as time to be present and participate in activities that he attends, and we invite friends over, go on dates, travel, and so on! Engage people that understand your needs – let go quickly if you get this wrong. Some of us rely on other people to help us maintain a work-life balance such as a family member, cleaner, or nanny. However, adding more people to the already complicated matrix of a family can be a serious confounding variable. So choose wisely. We once invited someone to support us in our parenting role and to provide me (as a mum who works from home) with the necessary time and space to get back to work. Over time, we realized that our original objectives were not being met. Changes are not easy to navigate in a family context but they are imperative for the smooth running and most importantly for the wellbeing of your family. Prioritize. If you want to achieve a sense of balance between your work and home life then you need to become an expert in prioritizing! Here is a simple technique that I use. I write down all the tasks I have to do and then put them under one of the following categories: a) urgent and important – these I will do first, b) urgent but not important – these I will plan for later, c) not urgent but important – these I will ask someone to help with, and d) not urgent and not important – these I will either let go or delegate. This simple task can structure your day, your week, and even your month, to provide you with specific goals to meet. Yet, the most important benefit is that it removes any feelings of being overwhelmed and frustrated while also being productive. Review your progress. If you put in the love, effort, and time needed to organize your family life, then you will get ample returns. Set time aside every week or month to review how things are going and if any adjustments are necessary. This gives clarity to everyone and a sense of accomplishment in your respective roles in the family. There is no need to sulk or complain. If something isn’t working for you, discuss it with your partner and come up with ideas to implement and change things. We find it empowering to put effort and planning into our lives. Reviewing our progress, makes us feel more in control and able to rely on ourselves to be happy. NB: This article was originally published here. Dr Patapia Tzotzoli founded My Psychology Clinic where she gained her reputation working as a Clinical Psychologist with clients on one to one basis in London and worldwide via online therapy. She specializes in adult mental health and couples therapy. Studied at the universities of East London, Oxford, and Cambridge and trained at the Institute of Psychiatry where she worked across world-renowned NHS Trusts. She specializes in adult mental health and couples therapy. Studied at the universities of East London, Oxford, and Cambridge and trained at the Institute of Psychiatry where she worked across world-renowned NHS Trusts.